This Lighter Buffalo Chicken Dip is healthier than the original but is still full of flavor and makes the perfect appetizer! Made easy by being cooked in the slow cooker. I was first introduced to buffalo chicken dip two New Years Eve's ago when my brother brought it for an appetizer at a party I was hosting. It was so good that we have had it a few times since. I love the tender shredded chicken, creamy sauce and spice from the dip. The problem is that the dip is typically very heavy and rich. As with all heavy recipes, I take it as a challenge to make it lighter but still taste great. I am so excited that I accomplished this and now have an easy and lighter go-to buffalo chicken dip recipe that is perfect for parties. Since March is all about basketball, you can make this dip for when you watch a game. It is filling, fun and easy to eat while watching a game. You could also make other fun dishes like my Texas caviar or fresh peach salsa! For watching a game, I make sure to get very sturdy paper plates so that they hold up on the couch. We set up all of our food on our dining room table and serve buffet style. 1. 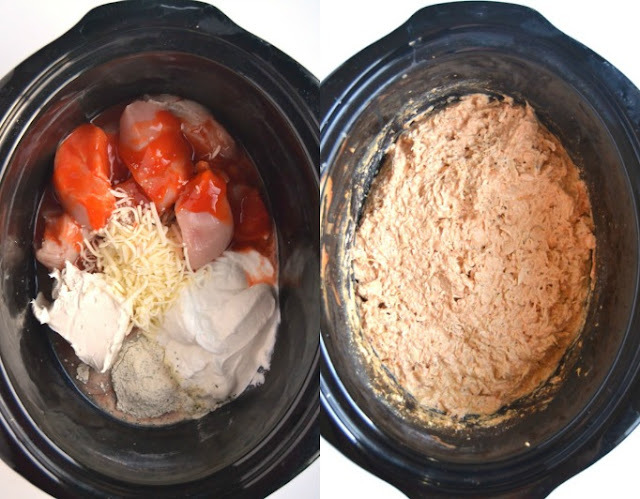 Toss all ingredients in a slow cooker and mix well. Cook on low for 3 1/2 hours or until chicken is cooked through and shreds easily. You may need to lightly shred with a fork. 2. Serve with dippers and enjoy! Usually, we serve buffalo chicken dip with chips, bread, crackers and/or celery. For this particular recipe, I decided to serve something that I grew up eating: Pringles. When we would go to my Busia's (grandma in Polish) house, she would always have Pringles for us to eat. We loved taking them in her room and snacking on them while watching a show. It was always a blast at Busia's house and I remember those times fondly.